Ang PN8-A Stained Glass ay inulunsad noong July 2010. Layunin nito ay ang mapaayos pa ang chancel Area. (see perspective). Ang nalikom na halaga para dito ay hiniram para pandagdag sa pinambili ng bagong sasakyan kasama ang seed money mula sa mag-asawang Ising/Boying Hayag. Ang 120,706 na kakulangan at Stained Glass na hiniram ay unti-unting babayaran sa loob ng tatlong taon sa pamamagitan ng mga pledge natin. Sa kasalukuyan ang ating nalikom ay P44,695.16. Ang halaga na kailangan nating idown sa Kraut Glass Works para maumpisahan ang pagpapagawa ng Stained Glass ay P100,000. Halina at maki-isa sa layunin na lalo pang mapaayos ang ating chancel area. PN8 which was launched during the 86th Anniversary month of SCCD. invites all members to donate and be part of this project to complete the works of SCCD sanctuary. A corresponding car toy material and stained glass cartons shall be posted in the 3D Tarpauline to complete the perspective of the Chancel Area. Come, let’s continue putting glitters at the altar! Launched during the 86th Anniversary month of SCCD in July 2012, PN8 invites all members to donate and be part of this another step to continuing works of the Church; a corresponding car toy material and stained glass cartons shall be posted in the 3D Tarpauline to complete the perspective of the Chancel Area. STAINED GLASS launched during SCCD’s 85th Anniversary now has garnered an amount of P69,000.00. And so we seek for members and households in continuing generosity to flow in their hearts for this project. Let us continue to give and bless the Church. Project Nehemiah 7: Stained Glass and works. Launched by the Deacons in July continues to plod slowly yet steadily, As of August 2011, it has generated the amount of P10,550.00 in cash. A mounted colored board were given to members who participate in this journey of funding the project. The Kraut (glass work) has given SCCD a projected amount of P150,000.00 –P200,000 this means that only P1,500.00 is pledged amount to every family. As per Kraut Glass works, a minimum of P100,000.00 is needed to start the works on the altar, hence, there is time to wait for more funds. Project Nehemiah 6: dubbed as ALTAR GLITTER launched this Anniversary month of JULY. To date the total expenses incurred in waterproofing works and other building improvements is 96,274.75, leaving us an amount of P80,818.05. This year’s anniversary, the church will open the PN6 dubbed as ALTAR GLITTER, where all members are encouraged to donate and a corresponding glittered material will be posted in the 3D Tarpauline to complete the perspective of the Chancel Area. 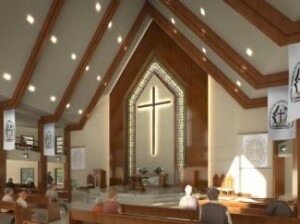 The Altar works and Church Sanctuary Improvement which commenced on April 18, 2011 is now on its finishing stage. ALTAR GLITTER series launched during SCCD’s 84th Anniversary now has 2 phase: one is the Mezzanine and Altar Works. To date Mezzanine has already received P28,662.00 and Altar Glitter has P66,025.00. Architect Amistoso will assume responsibility responded by the Boards approval for the following Sanctuary and Church Improvements of SCCD. ALTAR and SANCTUARY Improvements (including labour, scaffolding, painting, varnishing of doors, details, paneling and truss painting to be completed in 1.5 months costabout to expense at P40,000-50,000. And so we seek for members and household in continuing their generosity to flow in their hearts for this project. Let us continue to give and bless the Church. Project Nehemiah Altar Works contributions now amounted to P62,225.00. Project Nehemiah Altar Works begins. The sixth phase of SCCD church building construction activity on Altar works will begin on April 11, 2011 to give way to DLA graduation rites on March 30, 2011.The ALTAR works funding was reduced from a projected P150,000.00 down to P50,000.00 through the kind spirit of Architect Marie Amistoso and Associates. ALTAR GLITTER launched on SCCD’s 84th Anniversary now has amounted to P44,375.00, giving the Church through its leaders the signal point to proceed with ALTAR works inAcluding its decoration and important intricacies through the loving kindness of Architect Amistoso. Contract with service details already approved by the Church Council, Architect Amistoso will assume responsibility for the following Sanctuary and Church Improvements of SCCD. Phase 3 – FUNERAL AREA and CR to be situated at the Multipurpose Hall as approved in 2009. Phase 4 – CROSS Tinting and Glare. As of this writing Phases 2 to 3 are subject for further study and shall be focused accordingly with respect to the Church’s need and accessibility of fund. Continuing Works for Project Nehemiah – Altar Glare was curtained as per advice by Architest Marie Amistoso, our new Architect/Consultant after Architect Aileen Royo in several years conceded due to hectic schedule. Putting up the curtains to cover sun rays adding difficulty to reading what is being flashed using the LCD during the Praise and Worship. Curtains placed at the frontage cross as projected in the BOT has been lifted up as priority project according to Church need at a given period of time. As of this writing Phases 2 to 3 are subject to further study and shall be focused accordingly with respect to the Church’s need and availability of funds. CONTINUING WORKS for the CHURCH……. PN6 dubbed as ALTAR GLITTER was launched during the 84th Anniversary month of SCCD.PN6 ALTAR GLITTER invites all members to donate and be part of this another step to continuing works of the Church; a corresponding glittered material shall be posted in the 3D Tarpauline to complete the perspective of the Chancel Area. Another Project called Raising 55 will augment the need for the mezzanine railing which will cost P55,000.00. The said railing is needed for the purpose of security in the mezzanine area. Fund raising shall compose the idea of tapping 550 people to donate P100.00 each to cover the expenses.